Purpose: Hot flashes (HFs) are a particularly common and distressing symptom among breast cancer survivors (BCSs). Given its low rate of side effects, acupuncture shows promise as a therapeutic approach for HFs, but little is known about BCS's decision making about the use of acupuncture. This study seeks to identify attitudes and beliefs about using acupuncture for HFs by BCSs. Methods: Using the Theory of Planned Behavior (TPB) as a conceptual framework, we conducted semistructured interviews among women with stage I–III breast cancer who had finished primary treatment and were currently experiencing HFs. Interviews were taped, transcribed, and coded. We used a modified grounded theory approach to analyze the data. Results: Twenty-five BCSs (13 whites/12 African American) participated in the study. Respondents stated that their intended use of acupuncture for HFs would be dependent on (1) expected therapeutic effects (eg, pain relief, energy); (2) practical concerns (eg, fear of needles, practitioner experience, time commitment); and (3) source of decision support/validation (eg, family members, physicians, self). Although constructs in the TPB accounted for many decision factors, respondents identified 2 major themes outside of the TPB: (1) viewing acupuncture as a natural alternative to medications, and (2) assessing the degree of HFs as bothersome enough in the context of other medical comorbidities to trigger the need for therapy. Conclusion: BCSs expressed varied expected therapeutic benefits, practical concerns, and decision support, emphasizing the “natural appeal” and symptom appraisal as key determinants when using acupuncture for HFs. Incorporating these factors in counseling BCSs may promote patient-centered communication, leading to improved hot flash management and quality of life. BCSs are known to use complementary and alternative medicine (CAM) extensively.25⇓–27 Preliminary studies suggest that acupuncture may reduce HFs in BCSs, with fewer side effects than conventional pharmacologic therapies,28,29 and use of acupuncture has been shown to reduce HFs in BCS by greater than 50%, both during the day and at night.29 Acupuncture is associated with improved sleep quality among postmenopausal women30 and has been shown to continue to reduce HFs for as long as 6 months after treatment.31 Despite promising early results, evidence of acupuncture's therapeutic effects remains inconclusive, given the unequivocal benefit compared with sham controls and study design limitations.32,33 Like decision making for cancer treatment, BCSs often have a difficult time making decisions to manage HFs when several options exist and evidence is not clear as to the best option. In this setting, an understanding of individual patient attitudes and preferences are particularly important to help inform patient-centered decision making. Thus, we conducted this qualitative study to identify the specific attitudes, beliefs, and barriers held by BCSs about making decisions to use acupuncture for HFs and general beliefs about acupuncture. We also explored how these beliefs differ for whites and African Americans. We conducted open-ended, semistructured interviews with women with stage I through III breast cancer who had finished primary cancer treatments (surgery, chemotherapy, radiation) and were currently experiencing daily HFs. Participants were recruited from an outpatient breast cancer oncology clinic in an urban academic hospital. Purposeful sampling was used to ensure the sample was diverse in race, age, and HF severity. Specifically, we created a table to help guide enrollment so there were approximately equal numbers of subjects enrolled in the categories of white/African American and perceived HF severity (mild/moderate, severe/very severe). We analyzed the transcripts of already enrolled subjects and then aimed to enrich specific demographics (eg, women younger than 50 years) to capture a greater variation in the sample. Regulatory approval was obtained through the University of Pennsylvania's institutional review board as well as the Abramson Cancer Center's Clinical Trials Scientific Review and Monitoring Committee. The interview guide was developed using the Theory of Planned Behavior (TPB)34 as a conceptual framework. The TPB model contains 3 domains: attitude toward the behavior, subjective norms, and perceived behavioral control that contributes to one's behavioral intention.34 This model has been used in numerous research settings to understand the decisions about specific health behaviors such as mammogram use35,36 and in the context of CAM research.37,38 The interview questions were pilot tested and revised for clarity. Interviewers were all trained and supervised in semistructured interviewing techniques by the study medical anthropologist (FB). Each interview lasted approximately 1 hour and was recorded and then transcribed by a professional transcription company. Participants also completed self-reported surveys to collect general sociodemographic and health information. De-identified transcripts were imported into QSR NVivo 8.0 software (QSR International Pty. Ltd., Doncaster, Victoria, Australia) to manage the data. A coding scheme and coding dictionary were developed by the research team based on a close reading of the transcripts. Team members coded 5 transcripts together to improve the reliability of coding and to standardize code definitions. Research assistants coded the remainder of the transcripts. Coding consistency was determined using a feature built into the software for this purpose. Transcripts and codes were discussed during weekly team meetings. We achieved saturation on all major themes after 25 interviews. The study participants included 13 white women (52%) and 12 African American women (48%). The median age for participants was 57 years (range, 38 to 79 years). Fifteen study participants (60%) had a college degree or more, whereas 10 participants (40%) reported less than college. Eleven women (44%) reported entering menopause naturally, whereas therapy-induced menopause (defined as menopause being brought on by either surgical or medical processes) was identified in 13 women (52%). Among the participants, 15 (60%) had used some form of CAM in the past 12 months, and 10 (40%) had not. Furthermore, only 4 participants had used acupuncture in the past for symptoms unrelated to HFs. Each participant's characteristics can be seen in Table 1. We identified 3 themes related to decisions to use acupuncture among BCS that fit into the main constructs of the TPB: (1) construction of the effectiveness of acupuncture (attitude); (2) practical concerns related to using acupuncture (perceived behavioral control); (3) decision support and confirmation (subjective norms). 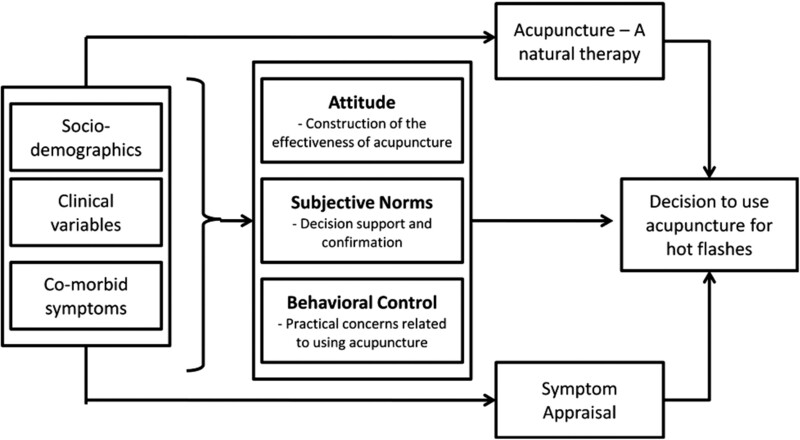 However, 2 themes related directly to patients' final decisions to use acupuncture were beyond the constructs in the TBP: (4) viewing acupuncture as a natural alternative to medicine; and (5) symptom appraisal in the context of other medical comorbidities. Most participants had a modest general understanding of acupuncture and none had any specific prior knowledge of acupuncture's effectiveness for HFs. However, many individuals had varying levels of expected benefits of acupuncture built on their personal experiences or those of their family members/friends, mostly related to using acupuncture to treat pain. Some drew from the exposure to mass media such as television and the Internet. They generalized what they learned about acupuncture for specific conditions (eg, back pain) to a much broader perceived benefit of acupuncture. Several African-American women relied on acupuncture's long history and wide use in China as evidence that the therapy has been tested by time and therefore must have some benefit for them. African-American women were also more likely to state that they had little exposure to acupuncture themselves or via family members than white women. Two white women with higher levels of education specified the need for evidence generated from clinical trials targeted at HFs to aid their decision for using acupuncture for HFs (see Table 2a). Some respondents stated that they would never use acupuncture because of their fear of needles. A few respondents wondered how acupuncture may affect their lymphedema (ie, will needling make their lymphedema worse?) or other medical conditions. Two women stated that pills are easy to take and therefore are a more desired choice compared with acupuncture. A number of women also listed finding a credible practitioner, location of the practice proximal to their residence, and the time commitment to the therapy as potential barriers to using acupuncture (see Table 2, B). The majority of the participants indicated that the decision to choose a treatment modality for HFs is entirely theirs. Participants often cited 2 groups of individuals they turn to when they make decisions about medical care in general: (1) family members (spouse, partner, or adult children); and (2) physicians. Interestingly, although some BCSs, especially white survivors, turn to their oncologists for issues related to symptom management, African Americans see their PCP as their main resource with the information to assist their decision making about treating HFs (see Table 2, C). When we asked why individuals may choose acupuncture for managing HFs, most responses were centered not so much on what acupuncture is, but rather what acupuncture is not, specifically, not a medication. This was true for all African American and most white respondents. Many of the women described medications as “toxic,” “foreign,” and having other side effects that may be worse than the HFs themselves. At the same time, they endorsed using a treatment that is natural even when effectiveness is uncertain. Several African-American women stated that they were already taking many medications for a variety of other conditions and they would not consider adding another pill to manage HFs as a viable option; thus, they prefer a natural alternative. African-American women used particularly emotional descriptors (“I hate pills”) when discussing their aversion to another medicine (see Table 3). Another main theme that emerged relates directly to whether an individual perceived her HFs as bothersome enough to initiate treatment of any kind. Women spoke specifically about evaluating whether their HFs were severe or bothersome enough to warrant another intervention in the context of their other medical conditions. Although some individuals cited their HFs as tolerable, several African-American women with severe HFs considered treating other symptoms (eg, back pain) as more important and in need of more urgent treatment by acupuncture than their HFs (see Table 4). HFs are a bothersome symptom affecting hundreds of thousands of BCSs. In this study, we identified attitudes toward and beliefs about using acupuncture for HFs, aspects of perceived behavioral control, and social norms related to the intention of using acupuncture for HFs. As expected from the TPB, we found that patients constructed therapeutic benefit and practical concerns in the setting of limited knowledge about acupuncture. Although they rely on family and physicians for treatment information and decision support; survivors often “own” the final decision. Beyond constructs in the TPB, we found that a desire for natural alternatives to medication was the main driver for survivors' intentions to use acupuncture. The primary reason survivors would not want acupuncture for HFs was an appraisal that their HFs were not bothersome or urgent enough to be treated when they were experiencing other comorbid conditions. Given the fairly modest understanding of acupuncture and a lack of specific knowledge of acupuncture for HFs, an individual often relies on her family and consults her physician about the use of acupuncture for HFs. Compared with white women, African Americans tend to turn to their PCPs for information about and decision support for symptom management. This is consistent with a previous study that found that African Americans were more likely to endorse the delivery of survivorship care by PCPs.8 Our study underlines the importance of PCPs being knowledgeable about acupuncture as well as therapeutic options for managing HFs in the context of survivorship so they can be well-equipped to facilitate decision making by their patients. Although the TPB has been used to explain intentions to use CAM,37,38 we were interested to find that it did not account for all the factors that women described as affecting their intentions to use acupuncture. The TPB, like much of traditional health behavior theory, is based on the underlying notion of rational thought in which patients are assumed to be highly motivated to maintain or return to a universally agreed-upon definition of good health.43,44 Rational health decisions are based on maximizing benefits and minimizing losses or costs.45 For example, the TPB posits that if a woman has a positive attitude about acupuncture (attitude), has no significant barriers to obtaining acupuncture (perceived behavioral control), and has important others in her social network who advocate for using modalities such as acupuncture (subjective norms), she will likely intend to use acupuncture for symptoms such as HFs. Despite this, we found that symptom appraisal and desire for a natural remedy were important determinants as well, even though they did not fit into the TPB model. Many interventions operate under a similar premise: that women will use a utilitarian model for making decisions about treating breast cancer symptoms. It is tempting to use traditional help-seeking models in research and practice because they explain much middle-class health-seeking behavior. However, these approaches treat as external to the model personal, cultural, and social factors that contribute to the meaning and experience of cancer-related symptoms. We have modified the original constructs in the TPB to include symptom appraisal and a subjective appreciation for treatment properties to capture the additional elements that women used when making decisions about using acupuncture for HFs (see Figure 1). Factors Linking Acupuncture with Symptoms of Hot flashes (FLASH Model). Our study is among the first to explore demographic differences in treatment decisions related to HFs by BCSs. African Americans seem to be much more willing to accept the empirical evidence from historic use as a rationale for their willingness to try acupuncture. Although we observed that all African American and most white patients endorsed acupuncture as a natural alternative, they arrived at this idea from different paths. Compared with whites, African-American women were much more likely to voice concerns about existing polypharmacy as a reason why another pill is not an option for them. At the same time, medical comorbidities such as ongoing pain may also serve as a barrier to using acupuncture for HFs for African Americans. Our findings may reflect the clinical reality that African-American patients are likely to have greater medical comorbidity, and often their decision of using a therapy for a condition is driven by multiple competing medical needs. Several limitations of our study need to be acknowledged. Our sample was of limited size and drew from an urban tertiary medical center. Although these factors affect the generalizability of the findings, we did reach saturation of topics (ie, no new themes emerged) by the 25th interview and thus feel confident that a larger sample size would not have yielded additional information. We studied decision making around intended use of acupuncture rather than actual use, so the factors may not fully capture the complexity of a true clinical decision. In addition, we conducted research from the perspectives of a PCP who practices integrative medicine (JJM) and a medical anthropologist (FB); thus, some degree of bias may present in our interpretation of the data. However, we often negotiated our different world views during research meetings. Finally, qualitative research seeks to identify a range of issues that are important among a group of people. It should not be used to infer causation or to quantify the magnitude of difference between groups in terms of beliefs or behaviors. Because early detection and better treatments for breast cancer have decreased mortality rates, the survivorship period has become a new area of research and importance. PCPs and oncologists need a range of options for women who are experiencing distressing HFs as a result of their breast cancer treatment. The evaluation of acupuncture for HFs is limited and ongoing; thus, the evidence base for it is limited, with conflicting results.32 This raises the dilemma for physicians to recommend for or recommend against acupuncture. In a situation in which there is no clear winner, incorporating patients' perspectives may lead to more satisfied decision making and outcomes. Our study found that acupuncture may be more congruent with some women's preferences for natural approaches to symptom management, thereby minimizing the need for additional medication. Clinicians need to understand that perceptions about the attributes of acupuncture are likely to vary according to racial group and symptom burden. When establishing the effectiveness of acupuncture in the real world, researchers must account for this variation in the acupuncture interventions that they test. Because PCPs play a critical role in decision support for cancer survivors, this understanding may help facilitate patient-centered communication to assist patients in choosing therapeutic options that are acceptable and lead to symptom reduction and a better quality of life. We thank the Penn Mixed Methods Research Laboratory for their assistance with the design, interviewee training, data analysis, and interpretation. We also thank all the breast cancer survivors for sharing their stories. Funding: This project is supported in part by the American Cancer Society (CCCDA-08-107-03) and the National Institutes of Health (1K23 AT004112-04). Prior presentation: This research was presented as a podium presentation at the Sixth International Society for Complementary Medicine Research Congress, Chengdu, China, May 2011. Disclaimer: The content is solely the responsibility of the authors and does not necessarily represent the official views of the American Cancer Society or the National Institutes of Health. Revision received September 12, 2011. Accepted for publication September 28, 2011.
. Caring for the breast cancer survivor: a guide for primary care physicians. Am J Med 2010;123(6):489–95.
. Hot flashes in postmenopausal women treated for breast carcinoma: prevalence, severity, correlates, management, and relation to quality of life. Cancer 1998;82(9):1682–91.
. Hot flashes and related outcomes in breast cancer survivors and matched comparison women. Oncol Nurs Forum 2002;29(3):E16–25.
. Weight gain is associated with increased risk of hot flashes in breast cancer survivors on aromatase inhibitors. Breast Cancer Res Treat 2010;124:205–11.
. Cognitive function, fatigue, and menopausal symptoms in women receiving adjuvant chemotherapy for breast cancer. J Clin Oncol 2003;21(22):4175–83.
. The association between nocturnal hot flashes and sleep in breast cancer survivors. J Pain Symptom Manage 2004;27(6):513–22.
. Adjuvant treatment and onset of menopause predict weight gain after breast cancer diagnosis. J Clin Oncol 1999;17(1):120–9.
. Delivery of survivorship care by primary care physicians: the perspective of breast cancer patients. J Clin Oncol. 2009;27(6):933–8.
. Management of hot flashes in women with breast cancer. Curr Oncol 2010;17(1):81–6. ; HABITS Steering and Data Monitoring Committees. HABITS (hormonal replacement therapy after breast cancer–is it safe? ), a randomised comparison: trial stopped. Lancet 2004;363(9407):453–5.
. Oral clonidine in postmenopausal patients with breast cancer experiencing tamoxifen-induced hot flashes: a University of Rochester Cancer Center Community Clinical Oncology Program study. Ann Intern Med 2000;132(10):788–93.
. Megestrol acetate for the prevention of hot flashes. N Engl J Med 1994;331(6):347–52.
. Long term use of megestrol acetate by cancer survivors for the treatment of hot flashes. Cancer 1998;82(9):1784–8.
. Intramuscular depot medroxyprogesterone versus oral megestrol for the control of postmenopausal hot flashes in breast cancer patients: a randomized study. Ann Oncol 2002;13(6):883–8.
. Gabapentin for hot flashes in 420 women with breast cancer: a randomised double-blind placebo-controlled trial. Lancet 2005;366(9488):818–24.
. 900 mg daily of gabapentin was effective for hot flashes in women with breast cancer. ACP J Club 2006;144(2):41.
. Paroxetine is an effective treatment for hot flashes: results from a prospective randomized clinical trial. J Clin Oncol 2005;23(28):6919–30.
. Approach to menopausal symptoms in women with breast cancer. Curr Treat Options Oncol 2002;3(2):179–90.
. Venlafaxine in management of hot flashes in survivors of breast cancer: a randomised controlled trial. Lancet 2000;356(9247):2059–63.
. Hot flushes. Lancet 2002;360(9348):1851–61.
. Nonhormonal therapies for menopausal hot flashes: systematic review and meta-analysis. JAMA 2006;295(17):2057–71.
. Managing menopausal symptoms in breast cancer survivors: results of a randomized controlled trial. J Natl Cancer Inst 2000;92(13):1054–64.
. Complementary and alternative medicine for menopausal symptoms: a review of randomized, controlled trials. Ann Intern Med 2002;137(10):805–13.
. Trends in complementary/alternative medicine use by breast cancer survivors: comparing survey data from 1998 and 2005. BMC Womens Health 2007;7:4.
. Complementary and alternative therapy use before and after breast cancer diagnosis: the Pathways Study. Breast Cancer Res Treat 2009;117(3):653–65.
. Complementary and alternative medicine use among cancer survivors: a population-based study. J Cancer Surviv 2011;5(1):8–17.
. Acupuncture versus venlafaxine for the management of vasomotor symptoms in patients with hormone receptor-positive breast cancer: a randomized controlled trial. J Clin Oncol 2010;28(4):634–40.
. Acupuncture for the treatment of hot flashes in breast cancer patients, a randomized, controlled trial. Breast Cancer Res Treat 2009;116(2):311–6.
. A randomized controlled pilot study of acupuncture for postmenopausal hot flashes: effect on nocturnal hot flashes and sleep quality. Fertil Steril 2006;86(3):700–10.
. Vasomotor symptoms decrease in women with breast cancer randomized to treatment with applied relaxation or electro-acupuncture: a preliminary study. Climacteric 2005;8(3):243–50.
. Acupuncture for treating hot flashes in breast cancer patients: a systematic review. Breast Cancer Res Treat 2009;115(3):497–503.
. Acupuncture for treating menopausal hot flushes: a systematic review. Climacteric 2009;12(1):16–25.
. The theory of planned behavior. Organ Behav Hum Decis Process 1991;50(2):179–211.
. Retroperitoneal hematoma due to rupture of a pseudoaneurysm caused by acupuncture therapy. J Urol 1998;159(6):2087–8.
. A controlled trial of placebo versus real acupuncture. J Pain 2005;6(4):237–42.
. Intention to encourage complementary and alternative medicine among general practitioners and medical students. Behav Med 2007;33(2):67–77.
. Psychological and behavioral mechanisms influencing the use of complementary and alternative medicine (CAM) in cancer patients. Ann Oncol 2008;19(1):49–55.
. Bridging the gap: decision-making processes of women with breast cancer using complementary and alternative medicine (CAM). Support Care Cancer 2007;15(8):973–83.
. Complementary and alternative medicine for pain management in U.S.- and foreign-born Chinese women with breast cancer. J Health Care Poor Underserved 2007;18(4 Suppl):118–29.
. Surviving breast cancer: the role of complementary therapies. Fam Community Health 2003;26(1):11–24.
. Breast cancer survivors' perceptions of complementary/alternative medicine (CAM): making the decision to use or not to use. Qual Health Res 1999;9(5):639–53.
. Cognitive representations of health and illness. In: Gochman DS, ed. Handbook of Health Behavior Research, Vol. 1. Plenum Press: New York; 1997.
. Can there be a “cultural epidemiology”? Med Anthropol Q 1999;13(4):436–57.
. Remembering what one knows and the construction of the past: a comparison of cultural consensus theory and cultural schema theory. Ethos 2000;28(3):275–319. Is Estradiol Monitoring Necessary in Women Receiving Ovarian Suppression for Breast Cancer?